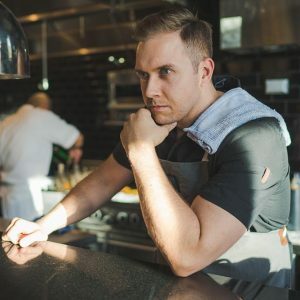 Darren MacLean is an Alberta-born chef who has reached much acclaim for his no-nonsense approach to cooking, depth of flavour and understanding of cuisines that stretch well beyond the prairies. A trip through rural Japan with Chef Yoshihiro Narisawa of Tokyo’s Narisawa—number eight on the list of The World’s 50 Best Restaurants—galvanized MacLean’s passion for Japanese culture and ignited his focus on sustainability and purity. In 2015 he opened Shokunin – defined as “a socially conscious craftsman or artisan” – which doesn’t so much describe the place as it does Darren. MacLean enjoys crucial details, such as importing authentic binchō-tan charcoal for charring his yakitori. Fish is an obsession: He’s is a fan of the Japan-originated technique ikejime in which a spike to the brain quickly paralyzes and dispatches the creature, thus preserving quality. At Shokunin elegant sashimi makes way for decadent miso lobster dengaku, the signature duck tataki with wasabi stem salsa, and “white soy” ponzu and shaved foie gras torchon. Shokunin opened up to rave reviews by top Calgary food critics, and is currently sitting at #35 on Canada’s Top 100 List.